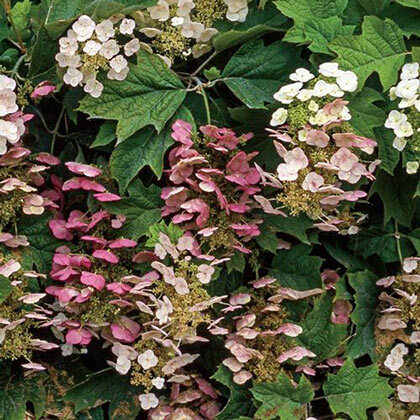 Pee Wee Hydrangea | Gurney's Seed & Nursery Co. This well-behaved plant is unique in that all of its parts (leaves, flowers, stems) are small and in proportion to each other, making it a true dwarf. Does well in shade or partial shade. Blooms for 8–10 weeks beginning in late May. Very attractive orange, red and purple fall leaf colors. Initial flowers are white changing to a pleasing rose-pink as the season changes to fall. Mature at 2–4'. Potted. Zones 6–9. FoliageDistinctive, deeply-lobed, somewhat coarse, deep green, oak-like leaves (to 5" long) turn attractive shades of bronze, maroon and purple in autumn. Mature stems exfoliate to reveal a rich brown inner bark which is attractive in winter. ColorInitial flowers are white changing to a pleasing rose-pink as the season changes to fall. PruningBloom occurs on old wood. 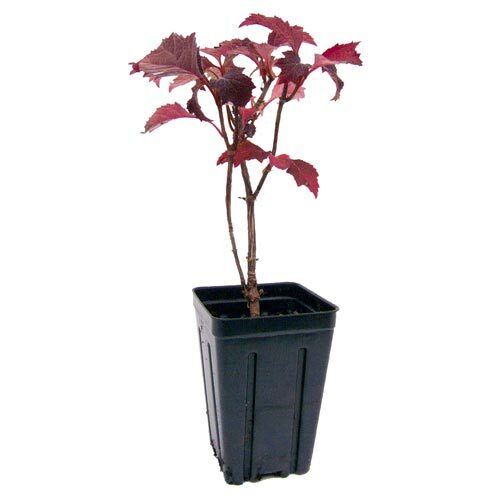 Prune if needed immediately after flowering (little pruning is usually needed). Winter damaged stems may be pruned in early spring. CommentsThis well-behaved plant is unique in that all of its parts (leaves, flowers, stems) are small and in proportion to each other, making it a true dwarf. Does well in shade or partial shade. Blooms for 8-10 weeks beginning in late May. Very attractive orange, red and purple fall leaf colors. Initial flowers are white changing to a pleasing rose-pink as the season changes to fall. Mature at 2-4'. Potted. Zones 6-9. DepthSet so roots are at or just below soil level. Firm and water in well.